Since the 2011/2012 season, SC Freiburg has been teaming up with up to 15 partners from the region under the motto “FAIR ways – It’s our responsibility.” These partners, much like the team itself, are actively dedicated to the topic of sustainability in education and training through support and utilization of renewable energy sources and by committing themselves to the environment and climate protection. Since the beginning of the current season in the summer of 2016, Franz Morat Group has also been a driving force behind SC Freiburg’s sustainability sponsorship. Cooperation and personal conduct are important values for specialists in the field of gear and drive technology active around the world. This is true both within the company group and in interaction with business partners and the general public. SC Freiburg and the FAIR ways concept also embody these values. For decades, Franz Morat Group companies, certified in accordance with ISO 14001, have placed high priority on the responsible handling of resources and have worked as suppliers for numerous sustainability sectors. The assortment of products ranges from components for electromobility to complex drive systems for renewable energy technology. The company conveys the same message as SC Freiburg in the areas of sustainable, high-quality training and youth development. The key argument in favor for taking part in FAIR ways was promoting nonprofit projects in the areas of education and ecology, which are imperative for the sustainability of the region in the future. The team can be even more effective paired with the engaged and dedicated FAIR ways partners and the publicity platform created by SC Freiburg. At the start of the FAIR ways partnership, Franz Morat Group was able to enter a sporting success in the books during the annual FAIR ways Cup. 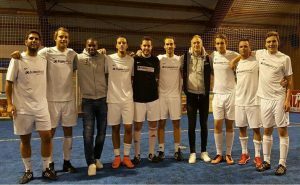 By the time the fourth tournament rolled around, the Franz Morat Group team came out on top among 27 other teams and secured the Challenge Cup. As usual, a portion of the registration fee went towards the benefit of a social project in the region. This year’s recipient of the donation was the “Freiburger Essenstreff” booster club, a homeless service.